It’s 4:20 am. And I have blood on my hands. I was sound asleep, as one is prone to be at 4 am, when I was woken by the sound of distressed chooks (that’s Orstrayan for chickens!). We’ve lost so many chooks and ducks over the years, that I always wondered what it was that was killing them, and this time, with a full blown rush of adrenaline, I threw some shorts on, snatched a torch, and ran down to my chickens’ enclosure only to find a fox and my rooster fighting it out over a hen lying on the ground! Your head goes into overdrive in such a situation… Never seen a fox up this close before, smaller than I expected too… but unfortunately for foxes, they have a long tail, and after wondering for one nano second whether foxes have ever bitten humans, I grabbed its tail, hurled it into the air and slammed it to the ground, killing it in one blow….. I can tell you, I’m even more amazed than you are! Half dazed, I walked into the bedroom to show it to Glenda who said “don’t f*** with Mike’s chickens..”! When I returned to the chook pen, I found the poor hen mortally wounded, and had to dispatch it as well, and now I have to process the poor traumatised bird so that at least all the work that went into raising it isn’t wasted. And revenge is sweet. 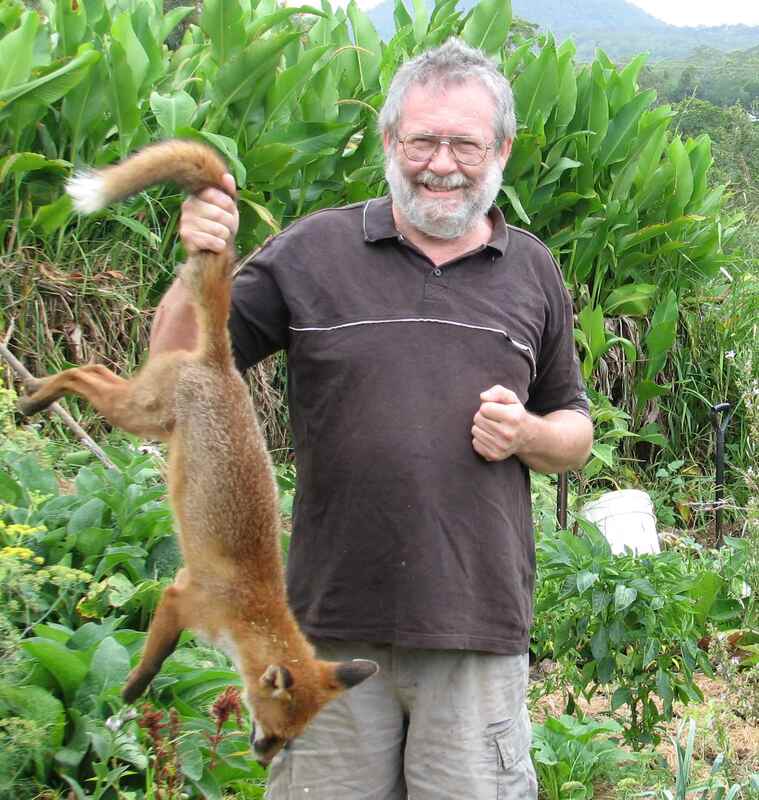 After a well deserved cup of strong coffee, I did a bit of research on foxes in Australia only to find they are an amazing problem everywhere. The Peak Oil Crisis: 2012 – Apocalypse Now? This would not be a biblical apocalypse or even a Mayan one, but rather an event of our own making. The world has made so many problems for itself in recent decades that the whole edifice of civilization is showing signs of coming unglued. This sort of thing has happened within living memory – remember 1914 and 1939 – so a year is which much comes undone should not come as a great surprise. If you are looking for a general theory of what is about to happen to us, you might start with Joseph Tainter’s The Collapse of Complex Societies in which the author identifies 17 examples of rapid societal collapse. In a nutshell, if anybody thinks the Roman Empire collapsed from too much complexity, one should look at the U.S. tax code or the efforts to refinance the EU’s sovereign debt. Compared to the machinations of the 7 billion people currently running around the world, the Romans were running a kindergarten. Whether the global civilization, or significant parts thereof, comes unstuck sooner or later is obviously a judgment call, but a case can be made that some very bad things might be coming in the next year or so. There would seem to be two fundamental problems behind the coming upheavals. One is that we are running into constraints on resources and the other is that the OECD nations have simply accumulated so much debt that it is unlikely to ever be repaid. No one ever thinks of the atmosphere’s ability to absorb and carry off carbon emissions as a resource, but as the world’s climate changes for the worse, that is exactly what it is. It could easily turn out over the course of the next 10 decades, that the atmosphere’s ability to absorb greenhouse gases turns out to be far more important than reserves of fossil fuels. Looking at what seems to be shaping up for 2012 that could be of apocalyptic proportions we have the rapidly deteriorating financial situation in the EU. Despite endless expressions of optimism on the part of political leaders, most unbiased observers believe there is nothing that can be done to prevent an economic downturn. Some are politely referring to this downturn as a double-dip recession, but others foresee a global depression equal to or worse than the one that occurred 80 years ago. The “worse than” thesis comes from the notion that there will not be the quantities of cheap energy available to support a recovery, and that there will have to be a major transition in the sources and use of energy before economic growth will ever resume. While most attention has been paid to refinancing debt, persistently high oil prices are gaining increasing recognition as a major factor in slowing economic growth. While high oil prices coupled with new technologies have brought forth new sources of oil, most commentators ignore the fact that this “new” oil is simply unaffordable in today’s economies. The older cheap stuff that we have been living on for the last century still makes up about 75 percent of our daily consumption, but, and this is a big but, the cheap oil is disappearing at the rate of 3-4 million barrels a day (b/d) each year. In 20 years cheap oil will be largely gone, replaced by unaffordable “unconventional oil,” if we can raise enough capital to exploit the stuff. Recent economic research shows that when the U.S. spends more than 4.5 percent of its GDP on oil, it goes into recession. Although there is some debate on how to calculate the price at which oil prices seriously damage the GDP, some say $90 a barrel will do nicely. Keep in mind that oil has been selling in most places for over $100 a barrel during 2011 and shows no signs of retreating very much in the near future. The second set of problems likely to explode in 2012 is the political instability. The most serious is in the Arab world, but as demonstrations in Moscow, China, Kazakhstan, Europe, and even mild ones on Wall Street show, social unrest is turning into a worldwide problem as resources become constrained and economic growth slows. Mankind now has seven billion mouths to feed and these are increasing by 70 million each year. There is going to be a turning point, the only question is when? Unrest and various geopolitical confrontations have already reduced or eliminated oil exports from Libya, Yemen, and Syria this year. Efforts to sanction Iran seem to be picking up steam and the oil markets are nervous that many countries soon will be forced to stop buying Iranian crude. The Syrian situation continues downhill and the delicate Iraqi political balance that was crafted by the US appears to have lasted for only a few days after the last US troops were withdrawn. It is a good bet that there is going to be less oil exported from the Middle East and possibly Central Asia by the end of next year – raising oil prices despite deteriorating economic conditions. On top of an emerging global economic downturn and the prospects for less oil from the Middle East, we have the United States where the electorate seems to have voted itself into political gridlock while seeking to vote for better times. It seems likely that very little in terms of improving economic policies will be accomplished in Washington until another election or two takes place and the electorate can sort out some sort of coherent path for the country. Until then a large case of fiscal austerity and more unemployment will be the order of the day. The case for major new troubles starting in 2012 rests on the likelihood of the collapse of much or all of the Eurozone and increased turmoil in the Middle East. The interesting part of this scenario is both of these situations can come about in numerous ways. This of course increases the chances markedly that something very bad will indeed happen soon. 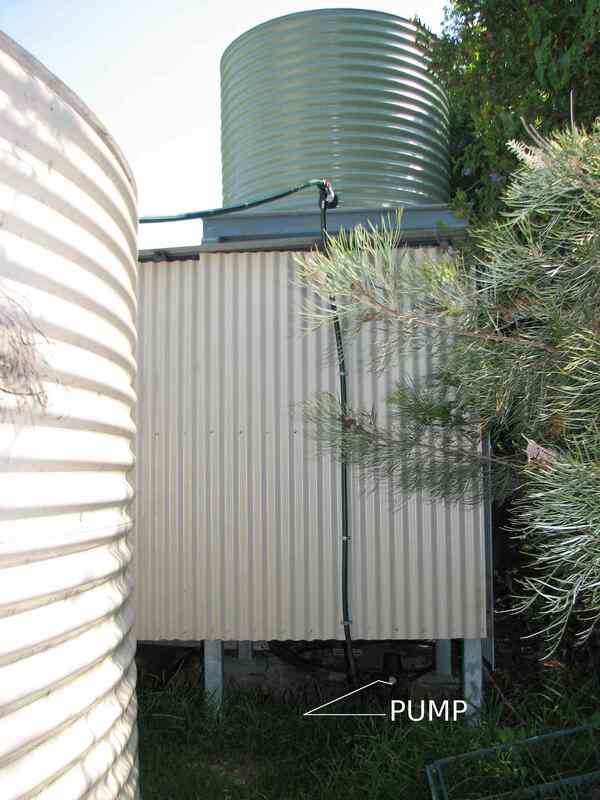 Plastic tanks are becoming very popular in Australia, but I much prefer the more traditional Australian steel tank. BHP make Aquaplate tanks for drinking water which is a food grade coating that doesn’t taint water and stops the tank corroding from the inside. They come with a 20 year warranty. This picture shows an improvement I made to our place last year. The shed was built out of entirely recycled building materials from a 100 year old demolished house, and I integrated a tankstand into the design. It’s made of new galvanised steel 100mm square posts which go through the steel roof on top of which is the platform the 2000L tank sits on (~550 galls). Between the four posts I built a “strongroom” where I can lock up all my valuables, such as they are…. Water is collected in the 22,500L (6000 gallon) tank at L of the pic, and pumped up to the header tank with a barely visible demand pump I picked up new for $90! It’s tucked away out of the weather under the shed. The water is exclusively used for the garden, and is another example of energy efficiency at work. The pump uses ~500W and only needs to run for 30 minutes to fill the tank (at a cost of 0.5 kWh). I can then water our 200m² garden for a week without using any power by gravity… Unless it’s very dry (and hot like now) in which case I might have to do this twice a week. The entire project cost me under $3000 including the brand new header tank.